If you ask me, anytime is a good time for chocolate. But once in a while, you need something extra special. You need this tunnel of fudge cake. It’s a dreamy chocolate on chocolate on chocolate dessert that’s perfect for Valentine’s Day, afternoon tea, or any celebration. And would you believe that it’s vegan, optionally gluten-free, and allergy-friendly for everyone to enjoy? There’s no need for any chocoholic to feel left out. Thanks to Enjoy Life chocolate, we were able to make a decadent cake that’s free of not only dairy, but all top allergens. We even tested it gluten-free! Enjoy Life baking chocolates are certified gluten-free, free-from 14 common allergens, verified Non-GMO, certified kosher, AND certified vegan and paleo-friendly, making them a dessert solution for individuals with many different types of dietary restrictions. 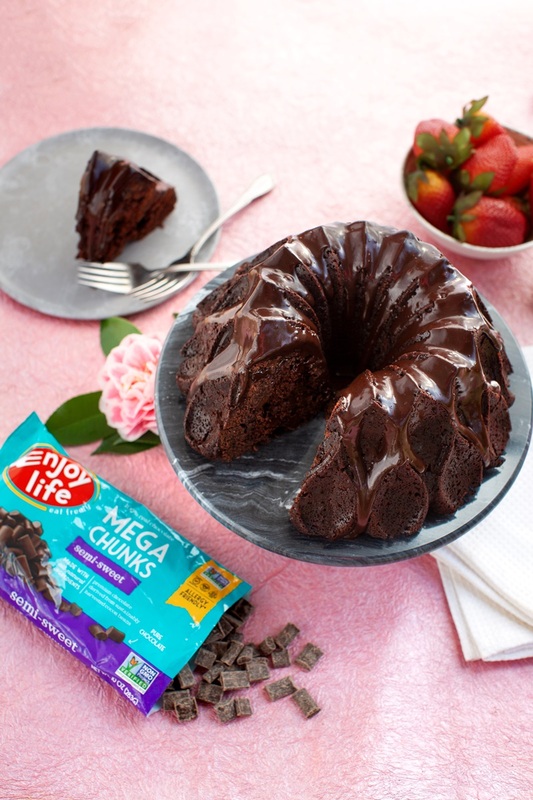 We opted to use the Enjoy Life Mega Chunks in the fudge bundt cake pictured, but the recipe is also delicious with their Dark Morsels. In addition to baking chocolate, Enjoy Life offers what I like to call “snacking chocolate.” It comes in bars, snack packs, and often minis! 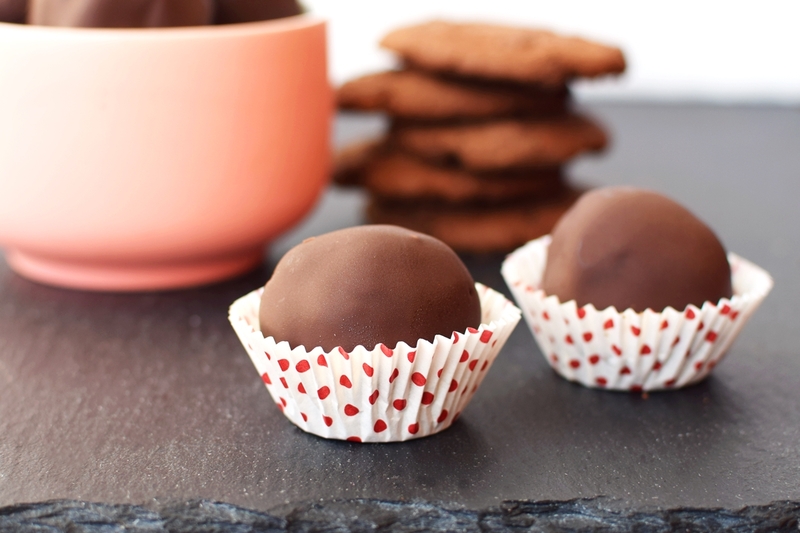 Enjoy Life Dairy-Free Chocolate Minis have been making special appearances at the holidays. First Halloween, then Christmas, and now Valentine’s Day! 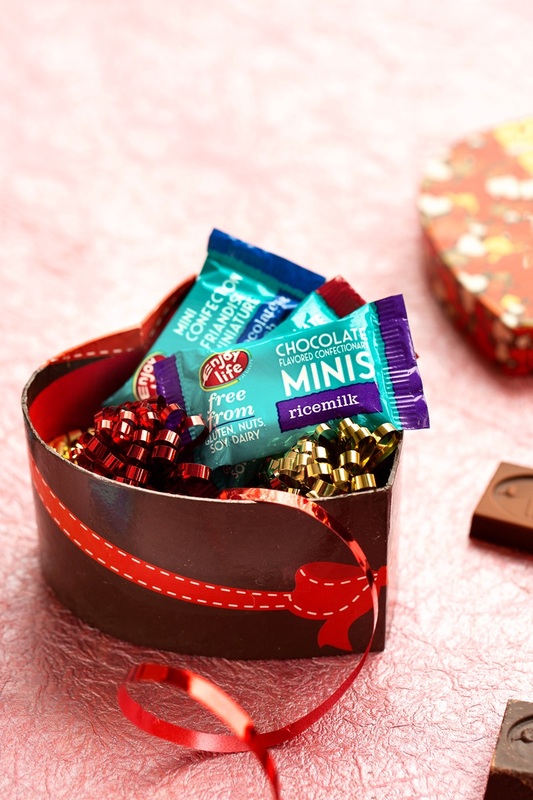 The Valentine’s Day minis are available in creamy Ricemilk Chocolate, Ricemilk Crunch Chocolate (move over Nestle! ), and Dark Chocolate. If you can’t decide they have a Variety Pack too. They are the perfect solution for classroom valentine’s, special treats for your loved ones, and more. 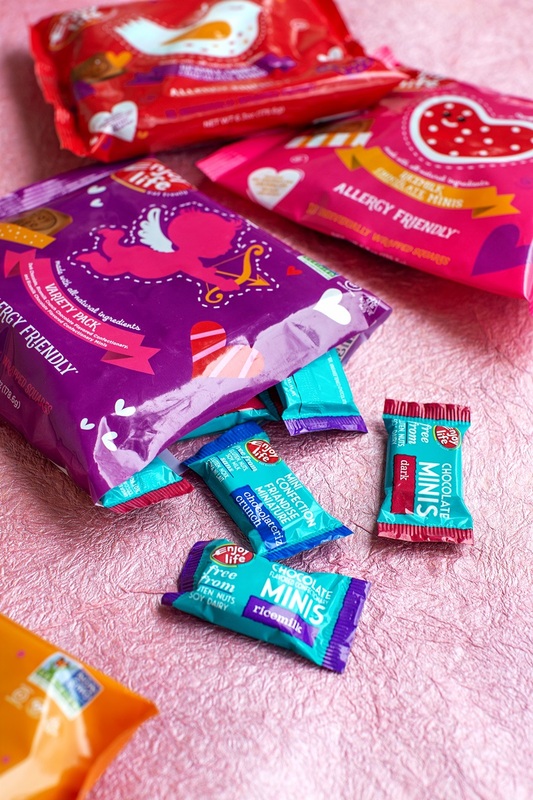 The Valentine’s Day Chocolate Minis are seasonal, but their full-size chocolate bars are available year round. And since they believe that love and chocolate don’t need to be limited to just one day, Enjoy Life is celebrating all February long with delicious chocolate recipes (like our nut-free, gluten-free, vegan Tunnel of Fudge Cake recipe below) and snack hacks. Follow Enjoy Life on Facebook for seasonal fun, and subscribe to their newsletter for new product announcements, sales, coupons, and more. 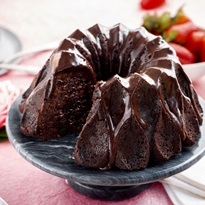 The original tunnel of fudge cake was a bake-off winner from the 1960s. It used pre-packaged mixes, so the recipe was later updated with from-scratch ingredients. But the classic recipe is still rich in dairy butter, eggs, gluten, and nuts. So Hannah, one of our talented Go Dairy Free recipe creators, took on the challenge to make a completely allergy-friendly and vegan tunnel of fudge cake. 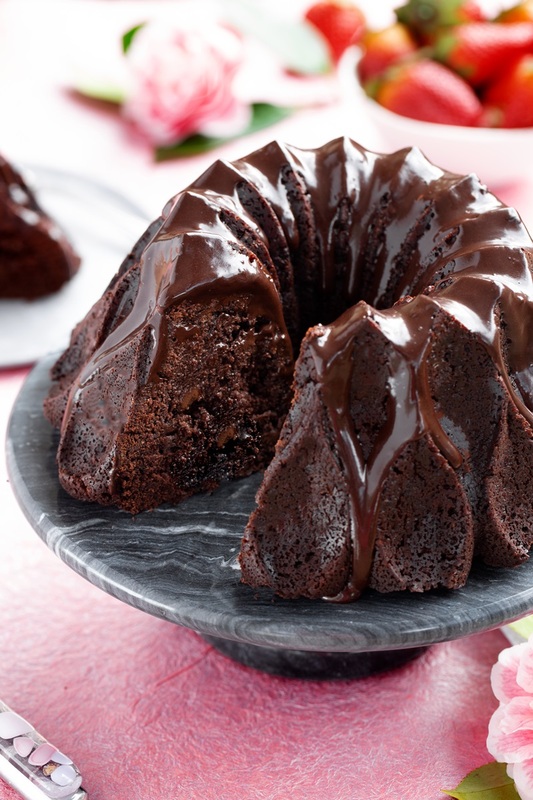 The Simple Secret: Tunnel of fudge cake is easier to assemble than your average bundt cake. With a river of gooey, rich chocolate running through the core, it’s essentially an under-baked cake, but with an extra dose of dark cocoa thrown in for good measure. We think the center of our allergy-friendly version tastes like a cross between fudge and cookie dough. Family-Friendly: This decadent dessert is dense, rich and intensely chocolate, but it’s still sweet enough that kids will love it. Hannah aimed for a well-balanced flavor profile that isn’t too sugary. Gluten-Free or Not: I asked Hannah to test this tunnel of fudge cake with regular wheat-based flour and with a gluten-free blend, since I know we have a diverse crowd of bakers and dietary needs. Either way, it is delicious! No Nuts Needed: They say that the nuts are a must in classic tunnel of fudge cake, but we decided that Enjoy life baking chocolate is a much more delicious swap! 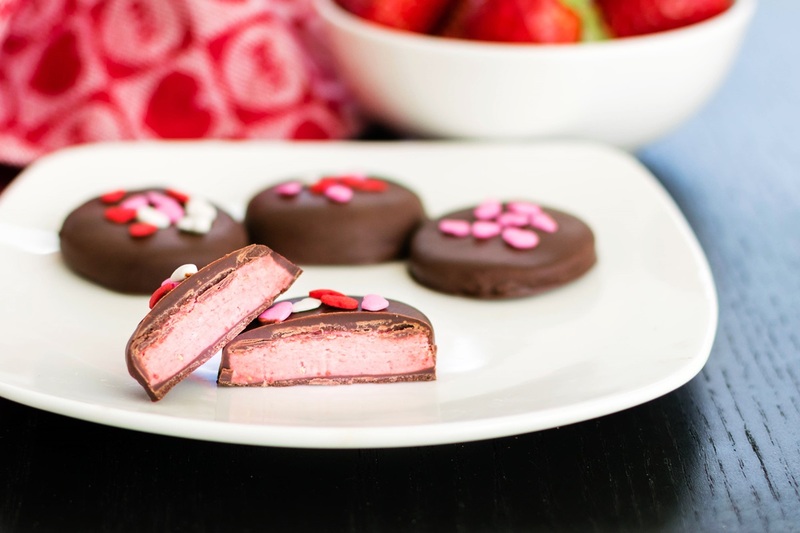 This post is sponsored by Enjoy Life Foods, in honor of Valentine’s Day! But the writing, opinions, recipes, and photos are all Go Dairy Free! 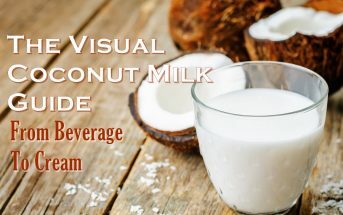 Photos and recipe by Hannah Kaminsky, a vegan cookbook author, photographer, and longtime member of the Go Dairy Free team. This cake is delicious when baked the same day, but you can also cover and refrigerate it for up to 5 days. Preheat your oven to 350 degrees and thoroughly grease a 12-cup bundt cake pan or 10-inch tube pan. Put the powdered sugar, buttery sticks, and brown sugar in a large mixing bowl. 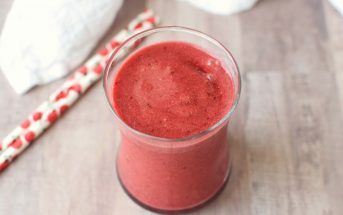 Cream with a mixer (start it on low) until thoroughly blended and smooth. In a medium bowl, whisk together the aquafaba, yogurt, espresso or coffee, and olive oil until smooth. 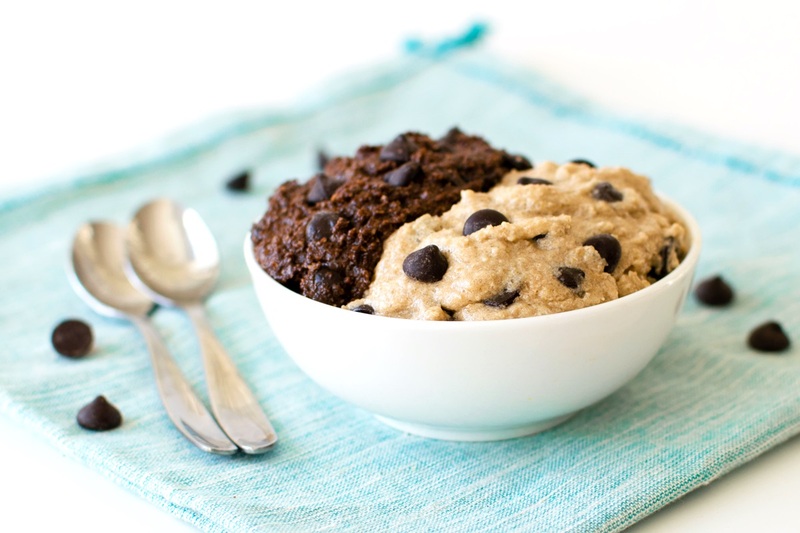 In a large bowl, whisk together the flour, cocoa powder, baking powder, salt, and baking soda. Add about half of the flour mixture to the buttery mixture and stir or beat on low speed until incorporated. Pour in half of the aquafaba mixture and stir or beat until mostly absorbed. Repeat with the remaining flour mixture followed by the remaining aquafaba mixture, stirring until just combined. Do not over-mix; some small lumps are okay. Fold in the chocolate chunks or morsels. Spoon the batter into your prepared pan. Tap the pan on the counter to release any air bubbles, and even out the surface with a spatula. Bake for 45 to 55 minutes. It’s tough to judge doneness since you want the center to remain “wet.” Look for the top to set and the edges to pull away from the sides of the pan, rather than using the traditional toothpick test. Let the cake cool completely before carefully removing it to a serving platter. In a medium bowl, whisk together the powdered sugar and cocoa powder. Slowly whisk in the water as needed. It should be thick enough to drizzle and cling to the sides of the cake. Apply the glaze generously to your tunnel of fudge cake. 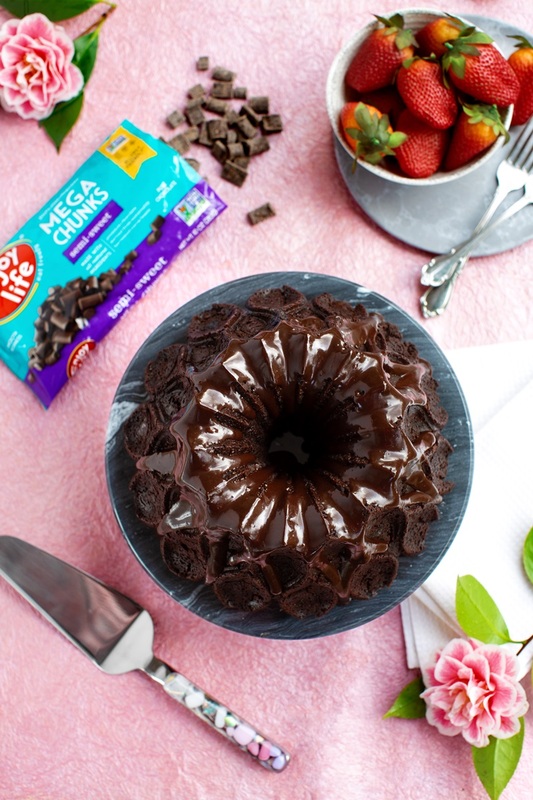 Totally swooning over this tunnel of fudge cake! Wish I had a slice right now! Yes, you need, make that DESERVE, a big slice Erin! Such a beautiful dessert…I love how chocolaty it looks. This cake looks so amazing Alisa and delectable! I wish I could find the time to make it tomorrow because I know I’d love it. Maybe this weekend because chocolate is good anytime! Agreed! Chocolate is definitely good anytime – try it this weekend – you won’t regret it Sarah!! Talk about craveable! This looks amazing. I’ve never worked with aquafaba. Showed the pic to hubby and his response was “oooooh…baby.” Guess I’ll be trying out aquafaba in baking! Haha, I get responses from my husband like that a lot when desserts pop on the screen. You can use eggs if preferred, or aquafaba if feeling like something new! I was surprised how “normal” it is myself when I first started working with it. Can we just use eggs? How many? Hi Amy, we haven’t tested it with eggs yet, but if I were substituting eggs, I would try 4 eggs in place of the aquafaba. I think so too Sarah! Thanks! This sounds delicious Alisa! 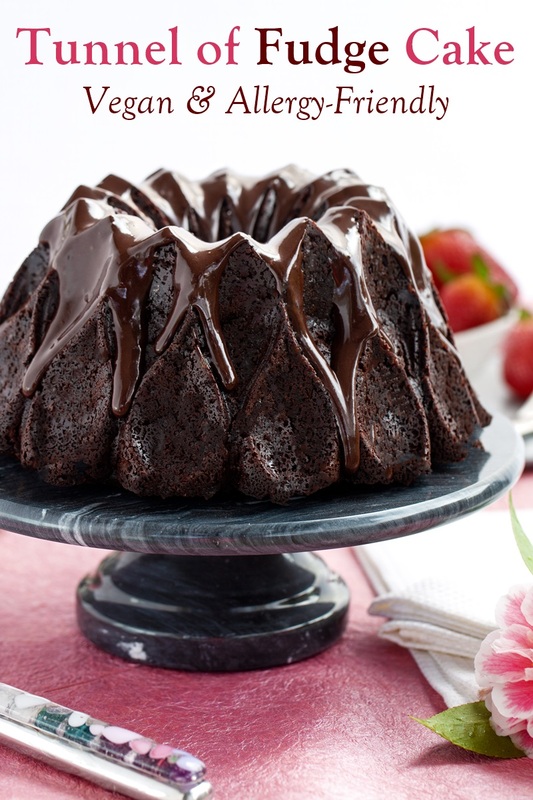 It reminds me of my lava cake but with the melted chocolate all on the outside….I love it! Definitely adding this to my list to make. Yeah, why mess around – gooey chocolate everywhere 🙂 I hope you get the chance to try it Nicole! This is….I can’t even describe how I feel about it! I’ll go with mouthwatering. So yes I’m pinning and YES I’d use the chocolate chunks. YUM! I’m all about the chocolate chunks too Jules! I’ve always liked the original Pillsbury Bake Off Tunnel of Fudge Cake, so I love that now there’s a “free from” option! I think everyone deserves this dessert, no? 🙂 Glad you got your minis in time Sarah! Oh my gosh, I need this right now! 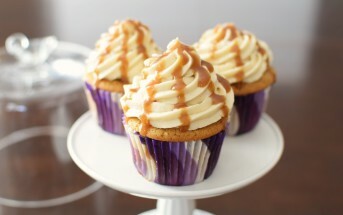 This looks so deliciously decadent!